Arden is a village and craft colony that was founded in 1900 by Will Price and Frank Stephens. The town was intended to be a model of the Georgist single-tax system. Price and Stephens hoped that the success of Arden would show the power of the single-tax community and ignite an idealistic shift across the United States. To this day, land cannot be bought or sold in Arden. Residents purchase 99-year leases. Shakespearean plays are central to Arden’s character and have been performed in outdoor theaters since it’s founding. The Arts and Crafts industry also played an integral role in the growth and development of the town. Notable residents from Arden’s history include Upton Sinclair, Harry Kemp, and Ellla Reeve Ware. The 163-acre town is approximately 9 miles from Wilmington, DE. Maude Rhodes was a weaver. 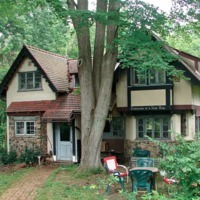 She lived in the utopian arts colony of Arden, Delaware in the late 1910s and early 1920s, at which point she was an older woman, unmarried, with graying hair and glasses. She lived in Arden for roughly a decade, and then left in the mid-Twenties, retiring to Jamaica. “Little is known about Maude Rhodes,” writes local Arden historian Mark Taylor in his book about the community, and indeed, the outlines of her biography are sketchy. During her time at Arden, however, Maude Rhodes was not only a weaver but also an entrepreneur. 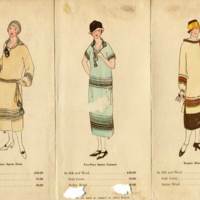 The stylish promotional materials left behind from her business endeavors piece together an impression of a woman who was intent on making her community's small-scale, home-grown textile production available to the wider modern world.